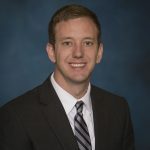 Ben joined the firm as an associate in 2016. He handles a wide range of litigation, including agricultural law, business litigation, employment law, insurance disputes, and personal injury litigation. Ben also advises clients on litigation related matters. Ben routinely represents individuals and businesses in both bringing and defending claims of breach of contract, personal injury, discrimination, and professional negligence. Ben has successfully tried cases before juries to verdict in both state and federal court. He received his B.A. from Wichita State University in 2012 and his Juris Doctor degree from Washburn University School of Law in 2016, where he earned a certificate in Oil and Gas law and Natural Resources law. Ben is licensed to practice in Kansas. While at Washburn University, Ben was active in the community and served on the Washburn University Student Bar Association all three years. Ben was selected to be a member of the Washburn Law Journal where his Comment on natural gas storage was published in the Spring 2015 issue. In his third year Ben served as Comment Editor on the Washburn Law Journal Editorial Board. Ben was also an intern at the Washburn Law Litigation Clinic and served individuals in that capacity in cases ranging from will preparations to landlord tenant disputes. Ben enjoys spending time with his friends and family, fishing, and is an avid technology enthusiast. Drinking a Milkshake from Someone Else’s Private Collection: How The Rule of Capture Remains in Play for Storage Gas, 54 Washburn L.J. 397 (2015).